Uses:- Teriparatide Injection is used to treat bone loss (osteoporosis) in people who have a high risk of getting fractures. 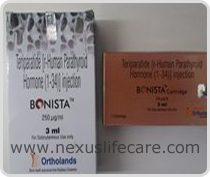 Teriparatide Injection is similar to a natural hormone in your body (parathyroid hormone). It works by increasing bone mass and strength. This effect helps to decrease the risk of getting a fracture. Side Effects:- Feeling light-headed or fainting every time you inject this medicine, fast or pounding heartbeats every time you inject this medicine; or nausea, vomiting, constipation, and muscle weakness.